There is a secret to life that is hardly ever understood let alone realized and achieved. But successful people -- people with a history of longevity of success i.e. proven success -- always seem to employ it. It is the science of faith to overcome. The US Marines are famous for their 'improvise, adapt, overcome' slogan. What I'm suggesting is very close to this US Marine philosophy. It is hard to implement because it is very practical. Hard work, character, commitment, and creative thinking are musts for it to work consistently. Yet, with a simple faith it is quite straightforward to do. We overcome best when we're thinking differently compared to the way the world typically thinks. The common person often thinks in ways that confound difficulty and make it worse, and this is certainly characterized in the taking of simplistic action by treating the symptom of problems rather than the cause. Little do these people realize that a slightly different attitude and approach, one that expresses faith, could have overcome the situation -- and often in the most creative ways, that in retrospect would have been easy. We are so easily fitted with the right tools to overcome. For instance, we can simply 'Do good.' Thinking good is necessary to do good, and it requires a true heart based in faith. Another thing is to "Contend for the faith..." (Jude 3) There are many ways of interpreting Jude's imperative. The 'faith' he means is the gospel,' yet we could easily take it from the macro to the micro and see him telling us, 'Contend for your faith.' Not only does it take foresight and awareness to avoid being stripped of the faith to overcome, it takes courage, patience, and perseverance; in sum, resilience. And it's a moment-by-moment, constantly-aware kind of resilience; of royal bearing. 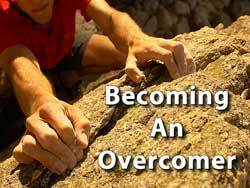 "God does not give us overcoming life: He gives us life as we overcome. The strain is the strength. If there is no strain, there is no strength. Are you asking God to give you life and liberty and joy? He cannot, unless you will accept the strain. Immediately you face the strain, you will get the strength. Overcome your own timidity and take the step, and God will give you to eat of the tree of life and you will get nourishment. If you spend yourself out physically, you become exhausted; but spend yourself spiritually, and you get more strength. God never gives strength for to-morrow, or for the next hour, but only for the strain of the minute. The temptation is to face difficulties from a common-sense standpoint. The saint is hilarious when he is crushed with difficulties because the thing is so ludicrously impossible to anyone but God." The whole Chambers quote leads us to the final sentence. With faith anything can be achieved, and in the light of hindsight, with ridiculous ease. Yet we are so apt at making our problems bigger than Ben Hur; certainly bigger than they ought to be. We're often against ourselves and our thinking can be our worst enemy at times. Faith is the key. When we can renew our minds through the Holy Spirit's charge over our lives nothing stands in our way, nothing. If God is for us who could be against us?